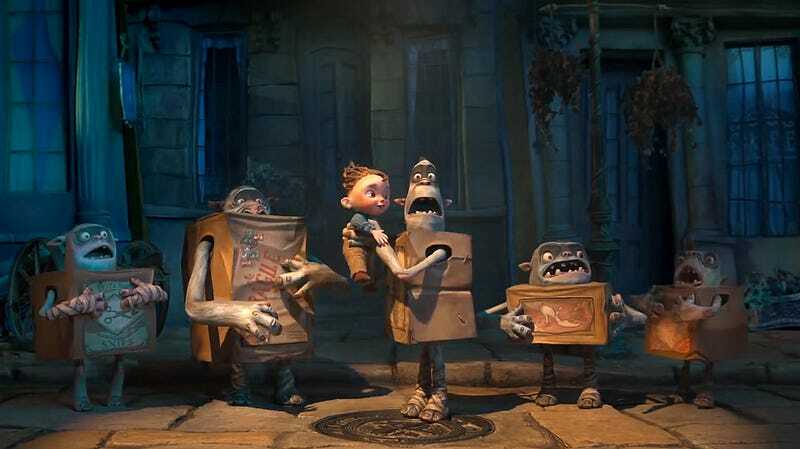 The voice cast of Boxtrolls includes Simon Pegg and Nick Frost, but also The IT Crowd's Richard Ayoade, Tracey Morgan, and a number of other comedians doing mad improv and getting their silly goofs animated by stop-motion puppets. But also, the unconventional friendship between Eggs (Isaac Hempstead-Wright) and Winnie (Elle Fanning) is full of ridiculous high comedy. It looks even funnier than ParaNorman was. We saw a featurette that interspersed lots of clips — some of which were in the trailer — with behind-the-scenes moments of these incredibly cool puppets being assembled and the scenes being put together. And it really showcases the story of Eggs, who's raised by these subterranean dumpster-diving trolls and thinks he's one of them, and who refuses to accept that he's a human — he keeps insisting he has a speech impediment and weird joints, and that's why he doesn't speak like a troll or live inside his box. And there are hilarious moments where Winnie is trying to teach Eggs to be a real boy — getting rid of his box, and getting him a proper outfit out of whatever stuff the trolls can come up with. And teaching him not to scratch his privates in front of people — that's why they're called privates. She tries to teach him to shake hands when he meets people, but he thinks this means actually shaking his hands in the air. Later, he tries that out, but then winds up also taking a fancy lady's hand... and licking it. Also, Winnie's father is the mayor of Cheeseborough, and he's a self-regarding pompous dude who is obsessed with cheese and has bought into the lies about the Boxtrolls being evil thieves who steal from humans, instead of kindly underground dwellers who take things from our garbage to build their world. The featurette really shows off how they created an immersive world, including real flames and real rain on the "sets." We also saw a couple of actual clips, one more emotional, and one more just ridiculous and fourth-wall-breaking. In one, the trolls are out foraging and they find an alarm clock, which Fish (who lives in a fish box) repairs. But then Shoe, who lives in a women's shoe box, steals it because he loves the ringing sound. Fish then finds a teddy-bear with a wind-up music box inside, which he manages to keep Shoe from stealing. The trolls nearly get caught by Snatcher (Ben Kingsley) and his big headlights, but instead they escape through a hidden hatch and slide down a conveyor belt into their amazing cavern, full of wonders like a waterwheel that generates electricity for their countless lights. Fish brings the teddy bear to Eggs, teasing him by waving with one bear arm, then the other, then finally popping the bear's head out of his box's head-hole. Eggs gets hold of the bear, only to tear it apart and pull out the music box — which he and Fish listen to, singing along in troll voices. Later, all the Boxtrolls pile their boxes up so they can curl up inside and go to sleep. And Eggs winds up at the top of the pile, sleeping curled up among the boxes with his teddy bear's severed head. And then there was a hilarious moment where two heavies, played by Nick Frost and Richard Ayoade, speculate about the meaning of life. What if this world is just a tiny speck, and there are giants moving everything? So that every time someone moves, it's actually a giant making it happen. We pull back and see Laika CEO Travis Knight, moving at immense speed, animating all their movements as they speculate about determinism and free will. One impressive part of the film that we glimpsed is the Mecha-Troll, a huge contraption that Snatcher builds to catch all the trolls. During the panel, we were told the Mecha-Troll is the biggest character in the film, over five feet tall. Kingsley says he did all his voice recordings lying down, because he wanted Snatcher's voice to come from his belly, not where it normally comes from. The movie's directors want Snatcher to be one of the all-time great animated villains, and Kingsley sees this as a character who is "constantly passed over by life" and full of unfulfilled ambitions. He has to create a world to conquer, so he can feel empowered. Tracey Morgan was only supposed to have one repeated catchphrase in the film, but he ended up ad-libbing a lot of dialogue in the film, as a "Victorian Terminator" who tends to narrate everything he's doing in any scene.